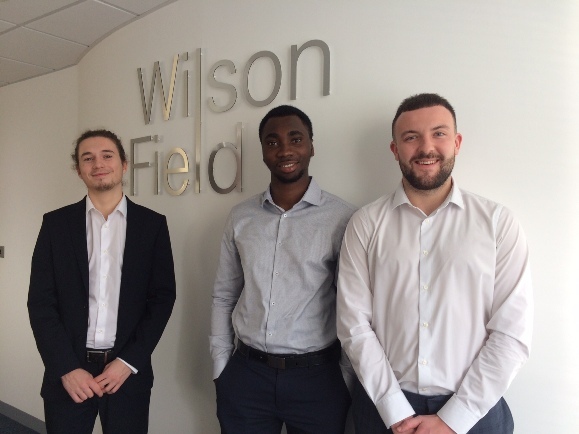 Yorkshire corporate recovery and business advisory specialists Wilson Field has taken on its first three recruits as part of a new graduate training programme. Joseph Potts, Eric Mensah and Sam Bentley have started as trainee case administrators at the 70 plus strong Sheffield-based business. The graduates in economics and finance, business and finance and law will now undertake a three year learning programme in the world of insolvency with quality in-house experience and a view to gaining professional qualifications to become a licensed insolvency practitioners. Julie Fantom, HR director at Wilson Field Group, said: “At Wilson Field we understand that progress is powered by people, so we need talented graduates to join us. “We are committed to provide learning opportunities and skills to enable our employees to sit relevant exams for a career in insolvency. “The Wilson Field graduate programme is a first step on a professional career. We believe in giving people the opportunity to get hands on experience. From the outset, the new graduates are part of a team that deals with formal insolvency procedures and will be learning the process of administering these cases. Graduate Sam Bentley said: “The insolvency world is made up of professionals with an aptitude for accountancy and an ability to understand the complexities of law, but who also have a strong skill set in client facing tasks. “Experience is a foundation of becoming an insolvency practitioner. This can only be achieved over time and working in the field, on a variety of insolvency types of various degrees of complexity. “Under the training scheme we are working with staff and a mentor for advice, guidance and support and not only gain academic and interpersonal skills, but skills in dealing with creditors, anxious directors, concerned employees and a range of other stakeholders. As well as personal development plans, fully funded qualifications on offer at Wilson Field include the Certificate of Proficiency in Insolvency or the ICAEW Certificate in Insolvency and the Joint Insolvency Examination Board – the qualification that must be passed in order to become a licensed insolvency practitioner. Graduates Gemma Roberts, Emma Bower and Ruth Jacks all came to Wilson Field as trainee case administrators and worked their way up to become licensed Insolvency Practitioners and Corporate and VA Department Managers. Wilson Field Group was shortlisted in the Corporate Restructuring Firm of the Year – 10 or less licensed appointment-taking insolvency practitioners at the national TRI Awards 2018 and in the professional services category at the Sheffield Business Awards which takes place on November 29. The company, which is headquartered in Sheffield and has a network of nationwide offices, is now the largest independent Yorkshire-headquartered insolvency practice, boasting eight insolvency practitioners and over 70 staff and an annual turnover of almost £7m. A new case worker training scheme has also been introduced by the company for current employees.